This thread is to discuss the best LBS (local bike shop) in different parts of the county. Also tell us what makes them great or what they specialize in. The owner Mark is very supportive of bike commuting. Prices are very reasonable. Stocks some commuting related gear. Always makes commuters a priority when they need a quick fix. Provides apprenticeships to local kids. Looking for a LBS recommendation for Carmel Valley area. A newbie commuter that lives near El Camino Real & Carmel Mountain Road is planning to start biking to work and needs some work done. Carmel Valley is a bit of a bike store desert. Closest ones would be down in Sorrento Valley. Can't comment on their shops as I do all my own work. There is the Evil Empire (Performance) which I would give mixed reviews. Hit or miss in terms of knowing their stuff. Cycle Quest and North of the Border are both near the Coaster station. I have chatted with the guy from Cycle Quest and he seems to know his stuff. Specializes in travel and commuter bikes but has some other stuff as well. Have heard good things from other people too. NOTB I have not been to personally but two people at work have told me positive things about it. Cycle Quest mechanic went to UBI last year. They specialize in select touring bikes like Surly, Co-motion, and Bike Fridays. I highly recommend them. I just noticed B&L Solana Beach moved, again, another bit north. At their old location will be a new Trek Superstore. I don't understand how there is enough business to sustain all the bike shops between Solana Beach and Leucadia on Coastal 101, not to mention the shops a bit inland from there. But from there south there is nothing, AFAIK, until you get to California Bikes in La Jolla, which is my LBS. They're high-end, but have entry-level and cool urban bikes too. Serge2: I just noticed B&L Solana Beach moved, again, another bit north. At their old location will be a new Trek Superstore. Velo Hangar in Solana Beach is awesome and a great place to hang out. Performance Bikes: yes, it's hit or miss, but at least when you go there you have a good idea of what stuff costs, and that it won't be ridiculous, because you can check online before you go. I have gone into other stores (including one mentioned above) looking for simple things, e.g. cables. I am greeted at the door, "what can I help you with?" I say I need new cables, nothing special. Store employee takes me over to the rack, pulls out two brake cables and two derailleur cables, says here you are. We start walking over to the register, I ask how much? He mentions a price, and I confirm "that's for all of them, right?" He says, no, that's for one cable. I say "oh" and walk out of the store. If I had a boutique store (such as a bike store), I would make it clear to the world: Yes, my prices are higher than internet prices. But I will not gouge you. I will charge you a reasonable markup, and you won't have an uncomfortable surprise when you go to the register to pay. Totally agree on the pricing and the Performance remarks. I do want to support local stores and since I worked in one for over ten years I have an idea of how things work. But I am not willing to pay crazy prices. Like a while back when I needed a replacement buckle for my Sidi shoes. One local shop had one but when they told me they wanted $20 for one !! I decided to wait. Got two mail ordered from Ireland for $12 shipped. I am in the fortunate position to be able to do all my own repairs and also will not need valuable face time with store personnel. So I do most of my shopping online to get the best prices and only go to a store if I don't want to wait or the price difference is acceptable. And yes, having clear price information and availability info before I go, like at Performance, is a good thing. It's all philosophical. I understand Batmick's position but I also know that we lost the shop that inspired this forum for whatever reason, so I'm committed to supporting locals. I've bought pedals from Adams, for instance, knowing that I could save %50 on Amazon, but I think we need Andrew where he is, as an anchor for so many activities and I value that. Regarding expensive boutique shops - I frequent one of the most expensive in the world, it's in my neighborhood, but it's also home to a great mechanic who is a personal friend who spends a portion of every day helping innocents with less than elite bikes fix their rides. I got my newest ride from another shop that some may find intimidating and know I'll have cradle to grave support that Performance and the internet will never offer. Don't judge all of those books by their cover - I know a lot of people were intimidated by the hipsterish rep of Velo Cult as well, but when we finally stepped inside we got a different view. My $.02 - support your LBS. 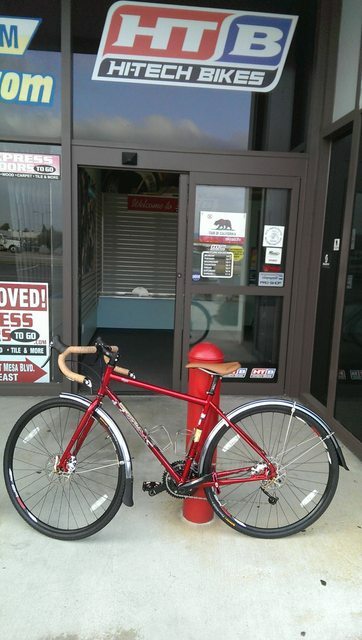 When I went to Adams Ave bikes after I bought that bike from OKB I had good and bad experiences with the employees. What broke the camels back is when I got my handlebars rewrapped and a tune up. I took the bike back from Adams in a rush, I was basically already on the road and holding the group up on a trip to Oregon. After I got back a week and a half later I actually inspected my bike, I was not a happy camper. I paid for handlebar tape and a tuneup, all I got was handlebar tape. My handlebars were still slightly crooked, my shifting cables with a abundant amount of slack, my chain full of grime, and the front derailleur was still basically making loud metal on metal love to the chain, etc... But the one little thing that made me crazy, what was a little front brake squell had turned into the sound of a pigs last breathes. I have since fixed all of this. Actually quit my construction job to go back to school and picked up a part time job at Sport Chalet as a bike mechanic. Just made my first visit to Metro Cyclery today to try out the Bromptons. I liked seeing Brooks and Arkel items in stock and enjoyed chatting with Bill, the proprietor, but Terra Rhythm is just around the corner, and Ryan is sure to make right whatever is wrong with your bike. I've always thought Adams Ave Bikes was top notch. They were the 2nd bike shop I checked out when I moved to SD. Great people, service, and knowledge. Part of the reason I joined their club. The personal experience means a lot which is why I've sworn off Performance and the Trek Superstores. They were great until you bought the bike. After that no so much. Trek was OK when it came to helping me out with a crash replacement but the overall experience lacked a personal touch as I had to go through some outsourced third party to try and get things done which was very much a turn off. Brooklyn is awesome also to get what you need in the evening or late at night when most shops are closed. I've gotten many odds & end parts from Richie on a donation based system. That's been a blessing now that I've eschewed buying new bikes and working on classics instead. These guys know their stuff. North Park Bikes is a newbie to our neighborhood and definitely one to check out. Stop in during Ray @ Night or anytime really. They have some great second-hand bikes and offer some great services and advice. Last and certainly not least is Messy Jessie's. Not a bike shop per se but she sets up shop at many of the local farmers markets (OB, Golden Hill, Hillcrest, and more) providing a free bike valet while you shop. Need some work done while you shop or want to spruce your bike up to make that trip to the market more efficient ... she's got you covered. Cliff notes version - forget Amazon, Trek, Performance, etc... and pay that extra $$ to your local bike shops. They'll be there when you need 'em to ask that question or help with this one little thing that the rest just won't or can't. There's a certain amount of respect involved and that goes a loooong way. Edit: Omission of a shop doesn't imply disapproval - just I haven't had experience with them to weigh in one way or the other. I live a block from Pacific Coast Cycles so I go there for everything. Seamus' Bike Shop in East Village has been my go-to place for honest opinions and repairs beyond my ability/tool-set since VC left. Seamus doesn't stock much, but his repairs and clinics are what makes this a true LBS for me. Locals come to tinker on their own bikes or junkers he has laying around with his advice to guide them. The guy works wonders with wheels. I brought him a clunker with rusty spokes that I wanted to squeeze a few more miles out of, since I was planning on swapping wheels in a few months anyways. He pulled it back to almost-true, and even replaced a spoke that broke for free (my fault for having such a rusty POS). When I asked him how much, he low-balled his own initial estimate because he wasn't happy that it didn't come out perfect. I paid full price out of respect for his integrity and high personal standards. I didn't get around to replacing those wheels due to various and sundry (and my penchant for buying more bikes than I need). When I finally get around to it, I'm getting them built by Seamus. His hours aren't totally set, but he's usually working much later than "official" closing time. And since he's across the street from Monkey Paw, I won't ever mind how long I have to wait for him to finish. my Salsa Vaya finally arrived and after talking with the guys at Hi Tech Bikes, they're going to be assembling her tomorrow. one big caveat is that i asked if i could stand alongside and watch and they were very encouraging. i'm eager to learn the mechanics not only for roadside maintenance, but also because i have a penchant for understanding how stuff works. they're charging $75 for assembly and cutting the seat post, but i feel that it's more than worth it supporting local as I wasn't able to purchase the bike from an lbs. will update my post after my sit-in tomorrow. just got in from Hi Tech and I had a heck of a time learning about the bike from the guys at the shop.. My experience at HTB was top notch and I would definitely recommend Chris and Eric to anyone in the area. They definitely made a noob feel comfortable and were happy to answer any questions that I brought up. Nice Vaya amper! I've got a 2011 Vaya that I ride constantly; perfect, versatile bike in my opinion. Spot at Pista Palace knows Salsas well, and they've moved their MTB knowledge over from Mucho Mountain Bikes which sadly no longer exists. Anybody know shops that might be particularly knowledgable about internal gear hubs? I'm not actually sure how much specialized knowledge they require, but I think that after six years, I may have succeeded in breaking my Sturmey 8 speed. A couple gears are slipping pretty consistently, but I don't know how to diagnose whether the problem is with the hub or shifter (I've heard the shifters are a weak point). Ideas? Come by Mission Hills Bike Shop, Kate has a lot of experience with internal stuff, especially sturmy. I was just going to post that I met Kate yesterday (thanks Messy Jessie for the intro), so I will definitely be bringing the bike by! Recently came back, with a pleasant experience, from It's A Bike Shop near Liberty Station in Point Loma. The owner, Eric, was a great guy to work with. I highly recommend anyone in the area give it a try. I've also been to REI and Hi-Tech before for shopping and small repairs. They are good people too. REI's free beginner bike maintenance classes are fantastic. Check their website for schedules. Roger and Yasuko Lovett run a wonderful funky little repair shop where service is quick (often while you wait) and affordable (so much so you may feel inclined to tip). Roger just cant get enough of bikes working on them all day. In his free time he's a bike commuter, frame builder, avid velodrome racer, and can discuss the wonders of campagnolo and bike racing for hours. A visit to Bernie's Bicycle Shop in Ocean Beach is a trip back in time. The neighborhood bike shop's space is small. Its vibe is local, coastal. The style is strictly mom-and-pop. Roger Lovett is the fourth person to have owned the OB establishment at 1911 Cable St. He's owned the shop, founded in 1968, since 1989. “We like biking,” responded Lovett about the appeal of owning his own bike shop, estimating 80 to 90 percent of Obecians own one.